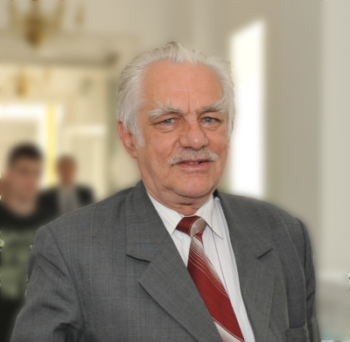 I am Ionel Haiduc, professor emeritus at the Chemistry Faculty of Babeş-Bolyai University, member of the Romanian Academy, correspondent or honorary member of science academies in Goettingen, Budapest, Chisinau, Montenegro, Academia Europaea and Leibnitz Sozietät (former Academy of Sciences of DDR). I was rector of UBB (1990-1993) and President of the Romanian Academy (2006-2014). I was teaching courses of inorganic chemistry and I introduced in the curriculum the courses of organometallic chemistry, supramolecular chemistry and methodology of research and science ethics. In my research I was preoccupied by the chemistry of inorganic rings, organometallic chemistry and supramolecular chemistry. I am proud with two more important achievements: the first book on the chemistry of inorganic rings – published in the Romanian language and two extended editions in English – and supramolecular organometallic chemistry – in collaboration, in English language, with a foreword by Professor Jean-Marie Lehn, Nobel laureate, the father of supramolecular chemistry. About the last one, in a book review in a journal of American Chemical Society was written: ”As a discrete field, supramolecular organometallic chemistry did not exist until the publication of Haiduc and Edelmann’s book Supramolecular Organometallic Chemistry”. More recently I am preoccupied with the promotion of the novel chemical concept of “inverse coordination”. I have the passion of following the science literature in the field of chemistry. I am trying to keep track with the novelties and to carry research in line with time and adapted to the new tendencies. I am glad that I managed to convert my hobby into my profession. My most recent achievement was the publication of two review articles in Coordination Chemistry Reviews, under the title “Inverse coordination – a novel chemical concept” (2017, vol. 338, pag. 1- 26; vol. 348, pag. 71- 95) which cover monographically the literature about a family of almost neglected chemical compounds, which in fact represent a new tendency in inorganic chemistry, an addition to the traditional coordination chemistry. One can say that “the trees have been splendidly described but the forest has not been (yet) recognized”. The two review articles are part of a series of six works, under active preparation. Question Daniel David: Which are your main future academic plans? At my age I don’t have long term plans, but only desires. I wish to see finished and published all the articles of the series about inverse coordination, and if the time “will be patient” to finish a book on Comparative Chemistry, which is half done so far. Question Daniel David: Why BBU? At the University of Cluj I became a chemist, then I got further training at some universities abroad (USSR, USA, Germany) and I returned to Cluj, where I am” at home”. Here I had the chance to work with intelligent, hard-working and ambitious students, to collaborate with colleagues from abroad who offered access to research facilities not available in Cluj (e.g. X-ray diffraction methods) and thus to follow my scientific interest and pleasure of some research which gave me much satisfaction. It was a challenge to work in more modest conditions but to achieve, together with my coworkers, works published in journals of best quality. I was visiting professor at universities in Ciudad de Mexico, El Paso (Texas), Athens-Georgia (USA), Goettingen (Germany) Santiago de Compostela (Spain), Sao Carlos (Brazil), Singapore, Malaysia, where I was teaching or giving lectures, or took part in research finalized in joint publications, but every time I returned home with joy. Question Daniel David: A short message to the BBU academic community? I would address, especially to the young people, the advice to set up in their lives, realistic goals and purposes, in agreement with their powers and work, to be saved from disappointments. To have a passion which to follow with determination and pleasure and to wait the reward and recognition to come by itself (even if sometimes may be delayed). Exaggerated ambitions can be a source of great unhappiness.